We need a database filled with some basic input so this is our database structure. One table for our books, another table for authors and a cross-table to join them. Additionally we need some data to query for ..
Just two plug-ins and one dependency needed: the jOOQ Maven Plug-in to generate our meta-model from an existing database, the Build Helper Plug-in for Maven to add the generated-sources-directory as a source directory to the Maven build environment and the dependency for the JDBC connector – in this case: MySQL. Our configuration for the jOOQ plug-in looks like this one. We’re binding its execution to a specific life-cycle phase, we’re adding the mysql-connector as a plug-in dependency and we configure how to connect to the database and some details for the code generator. More detailed information about possible configuration details can be found on the jOOQ documentation. In the last element, we’re advising the generator to store the generated classes in src/generated-sources/jooq. This is important because that is the location that we want the build helper plug-in to look for in the next section. This plug-in is like a swiss army-knife and if you’re interested in its other features, please feel free to have a look at the plugin’s project website. 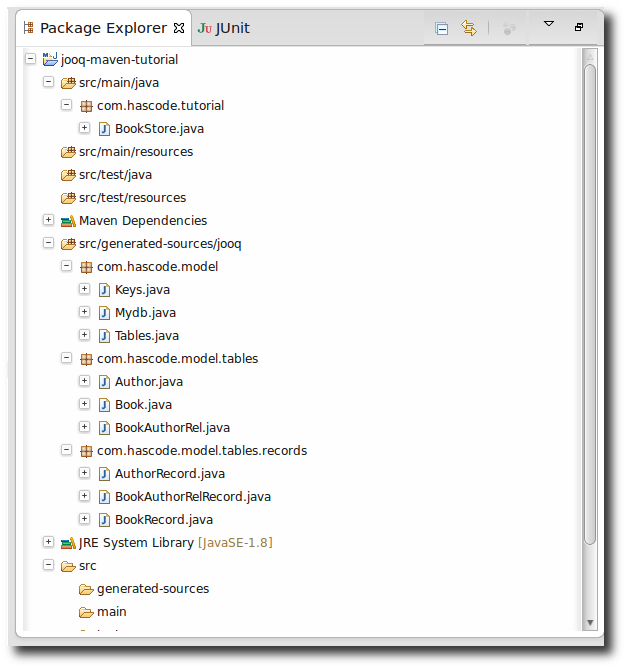 In our case, we simply want to add the directory with generated sources as a source directory to our Maven build. Using Maven profiles allows us to separate information that we would not want to save it directly in the pom.xml but pass it to the build by specifying profiles e.g. in your settings.xml or passing the parameters to Maven as a parameter like -Dkey=value. We’re now ready to generate our meta-model (assuming the database is running with the schema described above) like this. [INFO] Source directory: /data/project/jooq-maven-tutorial/src/generated-sources/jooq added. Now we should be able to see a bunch of generated files in src/generated-sources/jooq and you should see this directory configured as a source directory with the help of the Builder Helper Maven Plug-in. The m2e Eclipse Plug-in traditionally might display a warning that the jOOQ and the build-helper-plugin are not supported. At least for the second one we’re able to download an addition from Sonatype via the Eclipse Marketplace (using the Quick Fix Feature). Having generated the meta-model, we’re now ready to write an application to query our database in no time. The following example fetches all books for the author named ‘selena’ from the database and prints the result to the screen. This entry was posted on Tuesday, June 10th, 2014 at 6:12 pm	and is filed under Java. You can follow any responses to this entry through the RSS 2.0 feed. You can skip to the end and leave a response. Pinging is currently not allowed.